Fox Keychain Pepper Spray (Fox Labs manufacturer) is our best selling self defense product - In an emergency, its not a matter of what you use to defend yourself, but just having something available at that time makes all the difference. People have been saved from bear attacks using the small pocket unit (I'd recommend the larger can for bear). Hands down, this is the best keychain pepper spray unit made. This unit provides the convenience of pocket carry and the ferocious heat of the Fox Labs formula in the Fox Keychain unit. The pepper spray unit you carry in the car or have at home won't help you when you are at work or going to the store or shopping or on vacation. (Small pepper spray is allowed on checked baggage last time I looked). This Fox keychain pepper spray unit is just 3.5 inches long and has a belt clip. (and a detachable quick release keychain is available; handy for valet parking or other situations to allow you to maintain your control.) This keychain pepper spray contains enough formula for about 8 - 10 half second shots. Range is about 8-12 feet. These are plenty for even the most determined attacker, just douse his face. All 1/2 oz. units fire a pencil stream spray pattern. We have the best price on Fox Keychain pepper spray. Buy 12 keychain units for $9.45 each with low $3.95 shipping(entire order)! Shopping cart will figure discount automatically, even with different colors. Made by Fox Labs, this key chain pepper spray has the famous 5.3 million Scoville Heat Units formula. Only the best is good enough for your personal safety and to protect your loved ones. Notice: Go ahead and look, but this is the best price for the best product you will find, bar none! Don't be fooled by imitators, We sell more of this product than anybody. Its always fresh with the manufacturing date stamped on it. Our maximum shipping charge is $7.95 and goes to $3.95 for orders of $99 and more. 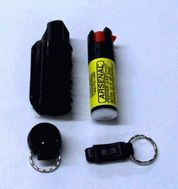 The quick release keyring allows quick separation of your keys from the pepper spray. Pepper Spray cannot be shipped to NY, MA, HI or AK or outside the USA. (Except Bear Spray and Muzzle Dog Spray can be shipped to NY, MI and WI). Any order that includes pepper spray will be shipped UPS or USPS Ground unless you specifically ask to split the order and ship the other items by air. Two shipping charges would then apply. Buy 3 fox labs keychains for only $10.95 each, need more? Get 12 for $9.95 each. Mix colors as desired. The shopping cart will figure the correct discount. Guaranteed! We will guaranty your Fox Labs keychain for 2 years. If it fails to spray during that time, send us the old can and we will replace it. We cannot ship pepper spray to NY, MA, AK or HI.